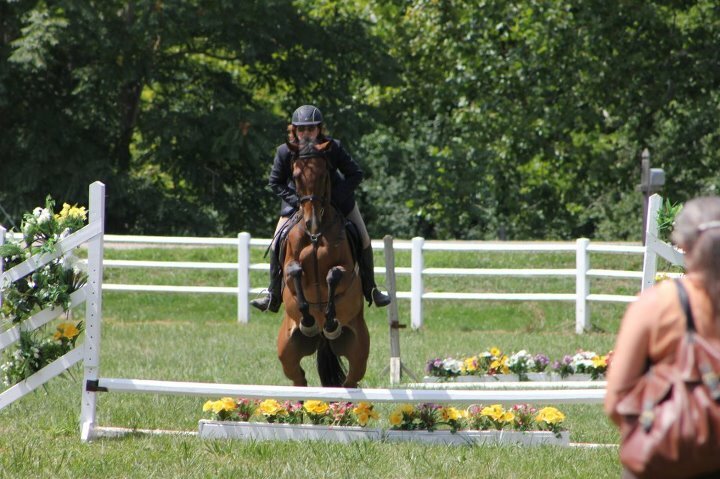 While Noble is a great horse to work with -- he's young, intelligent and willing -- his jump training was stalling. Literally. Think of travelling as a passenger in a car, you come to some train tracks and the driver hits the brakes. He doesnt' come to a complete stop but just before the stop, guns the engine. Yeah, it was kind of like that. Noble would approach a small fence (they're ALL small at his level), drop behind my leg losing any impulsion we had, then "bunny hop" the fence. EXTREMELY hard to ride and NOT end up punishing him in his back or in his mouth... which of course would make him MORE apprehensive, which would make the jump MORE hoppy... wash, rinse, repeat. After talking to a few people whose opinions I value and getting their input on some exercises to try, Anita and I have definitely made some progress in the last 2 rides! Last night he was calm and almost ho-hum about the whole thing... ground poles, tiny (12") verticals or crossrails! Plenty of transitions, including trot/halt (which often translates as trot/attempt to halt/ halt/backup/pat and proceed forward). Then calmly trotting over ground poles. It was like I was on a different horse! Once or twice he stutter-stepped his way over a pole but it was more to get the correct spacing (good) than an attitude of "OMG I HAVE to look at this then throw myself over it!" Finally trotted him over the vertical and crossrail and it was confirmed... we're making fantastic progress! What a good boy. Anita said she thought we made more progress than she did the previous day when she started with the poles. We also detected a problem with MY canter that was, in all possibility, affecting his. He doesn't quite have the "go" button that so many of my previous rides had. As a result I was keeping my leg on ALL THE TIME when cantering. Anita suggested getting the canter, then removing my leg. If he dropped, he dropped. Just ask again. It was amazingly frustrating to me as a rider. Logically I knew it would help, just like letting go of a horse that wants to rush a fence will help. But emotionally I was having to concentrate as much on staying loose and calm as I was in asking repeatedly for the canter. After a few minutes of this, we tried asking for the canter, pulling my leg off, then putting it back on before he broke. WOW! I'm sure we'll have to repeat the exercise again, but what a difference! 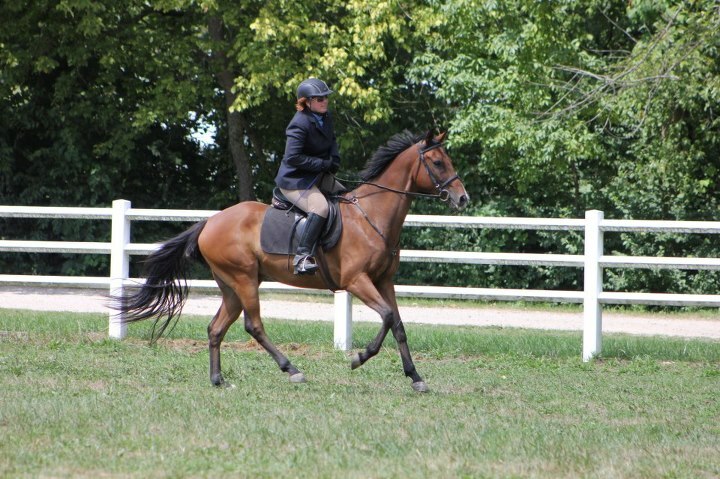 Not only did he hold the canter together all by himself, but when I did put my leg on, it made such an improvement. I didn't have to use as much leg either. I definitely think the improvement on OUR canter will make a huge difference in our jumping. Now he gets a couple days off as Isaac come through and I take Raz to the DLSC hunter show tomorrow. So things have been busy. Not always ON the farm, either. I figure if I'm going to keep up this blog (finally) I might as well keep chronicle my off-farm adventures as well as the on-farm ones. So in that vein... I have a new "ride"... meet Noble Rain ("Noble")... a 6 year old Thoroughbred/Appendix cross by Noble Houston. 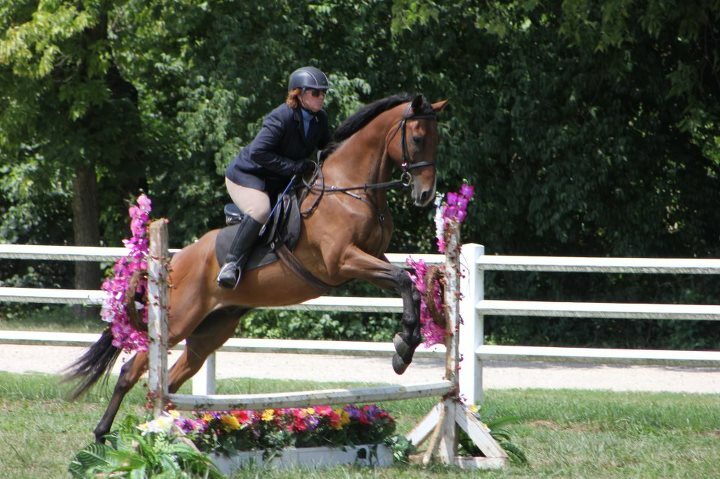 Noble is owned by Jennifer Shimp, owner of iTolt Training Center. Jen has been gracious and generous in allowing me to ride Noble. I've watched this horse grow up as he is out of an appendix mare named Rainy who was Char's turn-out BFF. Noble has been doing FANTASTIC!! Friend and dressage rider Anita Mays has been working with him on his dressage and he's really coming along beautifully. As for jumping, he's gone XC schooling (after only 2 jumping sessions), attended the Greenstone Hunter show (as pictured above) and just yesterday competed at the Greenstone Combined Test in both the Tadpole and Starter divisions. For Tadpole (Intro C dressage, 18" jumps - combination of crossrails and verticals), he was pretty distracted in dressage. I was told it wasn't nearly as bad as I thought it went, and that's what the scores showed. After a fairly non-existent halt earned us a 3, the rest of the scores were 5's, 6's and 7's, earning him a 39.5 penalty score. Jumping went better than dressage and we got around clean (no time on the round) landing us in 4th place. 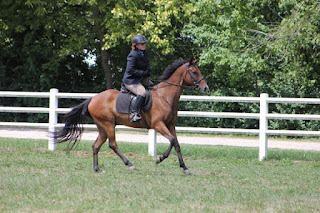 For Starter (Beginner Novice A dressage, 2' jumps), there were still some distracted "baby" moments. Those times, like during our free walk, where he just kept looking for his buddies. Oh well. The scores were even better earning us a 35.5. Jumping went better than the first round... a bit smoother which is what I was looking for. Things to work on... besides the distractedness, he kept picking up his right lead during jumping, almost exclusively. Also, just continuing to smooth out the jumping -- so he's jumping out of stride instead of picking at the fence and bunny-hopping it. 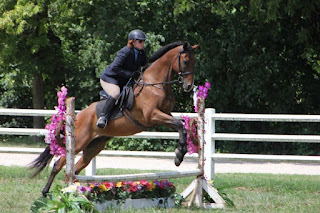 Saturday, September 15th - Stillwater Pony Club Hunter show -- showing Noble. Not sure what level yet, but want to take him so we can do our dressage test in the dressage ring... then go school cross country... then enter a hunter class or 2. After that, we have to see but I hope to take Noble to the Octoberfest Horse Trials at the end of October... and with any luck, at Beginner Novice. The finishing touch (removing a couple old posts) was being done when I left the farm this morning. 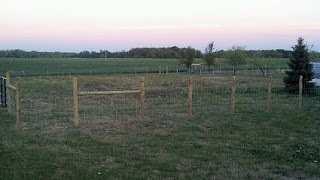 The new fence -- including the main pasture, new front field paddock and new west paddock is all installed. I still want/need to go back and cap all the t-posts and run electric at the top and about 2' from the ground (to help keep critters from leaning/rubbing on the fence), but it's DONE! And it looks fantastic. 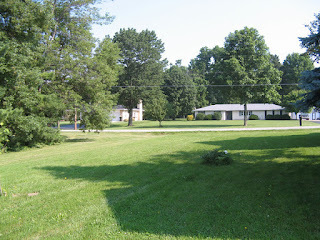 Taken prior to moving in, but after having plenty of rain (note the strange green color of the grass). Anyway, this was the west paddock. I mowed it. And that's pretty much all we did with it given how the house/doors are laid out. Just seemed like putting in a paddock would be a MUCH better use of the space. Almost the same angle as the photo above (but taken yesterday - note the brown color of the grass). Fence is 6' from the garage and angles in to be 6' from the bushes next to the house. 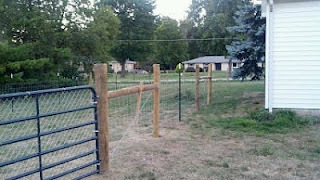 Combination of wood and t-posts with 4' field mesh fencing. The front posts are faced so I can eventually put in pretty looking 4-board along the road. West Paddock gates near the barn. Double gate facing barn/drive way to allow for pulling things through. 6' walk through gate on the far side. 12' gates at each end of the "aisle" to the main field. Basically it was an empty field. 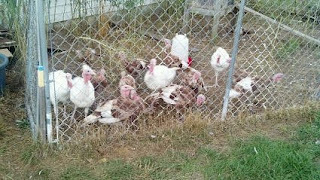 Last year with the turkeys I ran some temp fencing in part of it closest to the detached garage and brooder house for the turkeys to run in, but really it was an empty field. 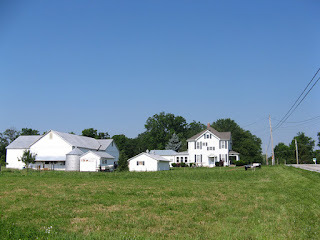 Picture taken from the far end (obviously) looking back towards the house. Opposite angle. The road is to the left of this pic (taken from the driveway, house is behind). The area is a stand alone paddock as there's an access drive on the far side so there's room between this new paddock and the main field/fruit trees to drive through ... like a turn around. In addition there's a "high spot" along the road so I installed a double gate (far left in the photo) so I could use it for parking or whatnot if needed. Looking back behind the buildings. 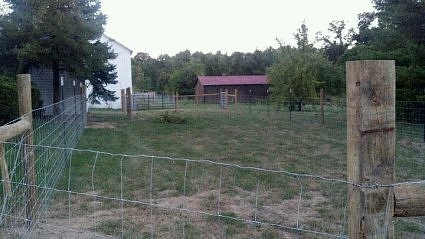 Since the back of the buildings are offset, the paddock fencing runs to the garage, and I added an extra fence & gate to finish a smaller area that I can use for the turkeys to be penned up in as needed. Should work pretty well if it goes according to how I see it working. This will be the primary turkey area when I have them. Going to fence off with temp fencing into 3rds so I can rotate the field. May not raise as many next year so I may not have to do that, but it should work pretty well int he meantime. I can also lead animals to this paddock or rig up something to keep them from getting out of the "drive turnaround" in betwen this and the main field (about 20') to let them come and go. Front Field paddock is approximately 1/3 acre total. I dont' have any specific pics of the main field. Nothing much to see there, but it's just as pretty. 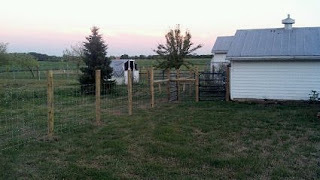 Reused the main field gate and installed a new 6' walk through gate in the front. 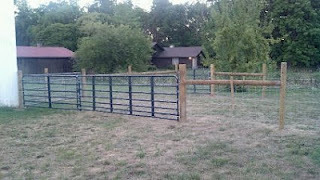 In addition, there's a 12' gate to the aisle leading to the west paddock and a new 16' gate in the west fence line - in the hopes of still being able to pick up that 1.68 acre parcel from the neighbors. Starting to look yummy (even more tasty every night when they look like little vultures when they manage to climb on the roof of the brooder house to roost). Can't wait to let them out and have more space! MOO COWS!! 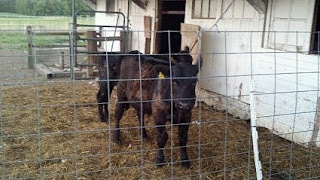 Last night in bovine alcatraz before they get out on the grass. They better not get out of this fence or I'm going to be extremely angry. The big one will come to me (he LOVES apples, I think he'll like the pears but right now they're still a bit unripe and hard), but the little one is still pretty skittish. I can't believe how quickly the summer has gone. I also can't believe how long it's been since I updated. I'll post pictures soon, but I am going to post a basic overview of updates now... and go into detail in the coming days. The turkeys are getting HUGE! I also think the Bourbon Reds taught the BBWhites how to fly as I didn't have this problem last year. I have turkeys posing at gargoyles on the roof nightly, despite clipping their wings a couple weeks ago. Will be having my first home grown chicken dinner tonight as I finished butchering the last of the meat chicks last night. Not sure I'll do this chicken experiment again, but it was worth doing once. And I'm sure dinner will be tastey. Fencing project will be complete TODAY! Can't wait to take pictures. It's VERY nicely done. 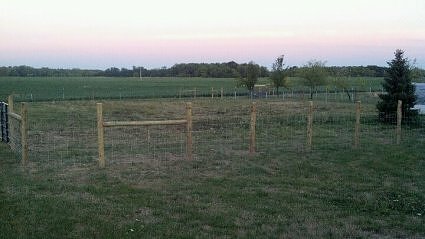 Thanks to Eagle Fence & Construction in Lewisburg. Will be running the electric around the main field so I can turn the cows out ASAP. They're going to LOVE it! No horses at the farm currently. Teddy and Map both went out for training. Map came back and is at home (iTolt) and Teddy is in the process of being sold. My own personal horse search is on hold til spring. I do, however, have a new horse I'm riding. 6yo TB/Appendix gelding named Noble Rain. I've watched him grow up as Jen bred him. He's out of a mare that was Char's BFF in the pasture. We did our first XC school on him this past weekend and I'm SO pleased. There will definitely be more updates on Noble's progress in the coming weeks. New Roommate. New roommate, Ryan, moved in last week. 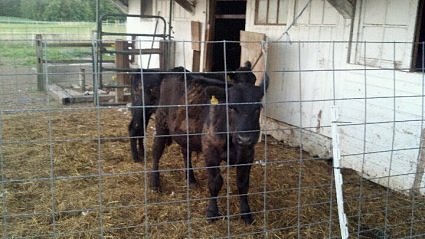 Thankfully he'll be taking on some of the feeding chores, along with just plain being at the farm, when I'm out of town so less to worry about. Rental house has new tenants and they're in a lease to purchase arrangement (which includes them doing repairs and whatnot as if it were their own) while they improve their credit. I'm excited about it. I'm also in the middle of getting the place refinanced -- a process that is NOT going smoothly at all, but will be worth it in the end. In the middle of reading "How Good Riders Get Good" by Denny Emerson. Loving it! and last, LOVED the coverage I was able to see (mostly online streaming) of the 3-day Event from London. Sorry to see the US performance not quite up to our usual standards but happy for those that did medal.